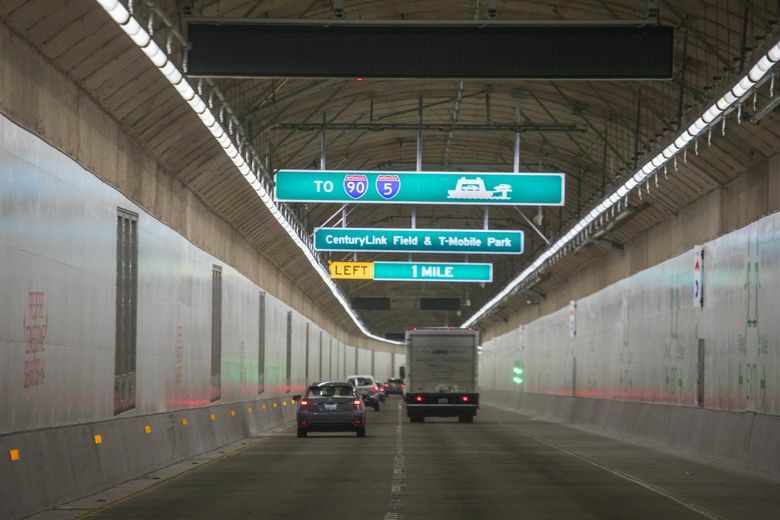 The Highway 99 tunnel, which has been open for about two months, will receive its first checkup this weekend, bringing temporary lane closures and traffic detours. Overnight on Friday, southbound Highway 99 traffic will exit at Harrison Street so crews can inspect the tunnel and make any maintenance fixes. The closure is from 11 p.m. Friday to 8 a.m. Saturday. In other road work, the South Dearborn Street/Alaskan Way offramp on northbound Highway 99 will be closed nightly this week through Friday from 9 p.m. to 5 a.m., while crews working for the Washington State Department of Transportation install new safety railings. Drivers who want to access the waterfront should use East Marginal Way, First Avenue South or other surface streets, the agency said. There will be no exits on northbound Highway 99 between the West Seattle Bridge and the north end of the new tunnel. Between Denny Way and Harrison Street, the northbound lane of Aurora Avenue North, now called Seventh Avenue North, will be closed between 9 p.m. and 5 a.m. nightly Tuesday and Thursday while crews install temporary lighting. The southbound lane will be closed Wednesday night, also to install temporary lighting. The northbound lane of Seventh Avenue North will be closed again from 9 p.m. Friday to 5 a.m. Monday so crews can pave roadway. Drivers will be rerouted onto Dexter Avenue North during the closure. In addition, overnight lane closures are planned on portions of southbound Interstate 5 in Seattle this week for repair and resurfacing work.